1913 (MCMXIII) was a common year starting on Wednesday of the Gregorian calendar, and a common year starting on a Tuesday in the 13-day slower Julian calendar. It was the 913th year of the 2nd Millennium, 13th year of the 20th Century and the 4th year of the 1910s decade. March 4 - Woodrow Wilson becomes the 28th President of the United States, succeeding William Howard Taft. March 12 - Building work begins on the new capital city of Canberra in Australia. May 29 - Rite of Spring performance in Paris. July 10 - 56.7 degrees Celsius (134 degrees Fahrenheit) is recorded in Death Valley, California. October 14 - The Senghenydd Colliery Disaster in Wales kills 439 people, in the United Kingdom's deadliest mining tragedy. November 7 to November 11 - The Great Lakes Storm kills over 250 people. 19 ships in total are lost. December 12 - The Mona Lisa is recovered in Florence. 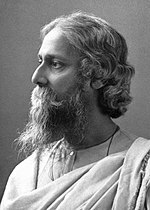 Rabindranath Tagore, who won the Nobel Prize in Literature. This page was last changed on 5 September 2014, at 02:18.